I know I’ve been singing the praises of the Pampelmoose blog recently, but it really is worth checking out at the moment. 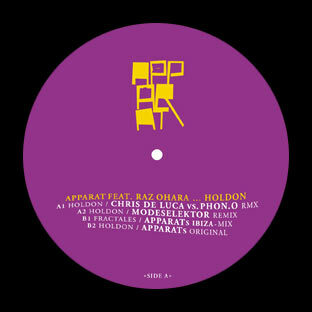 Dave Allen has been posting some very interesting mp3’s of late, and one definitely worth listening to is the Modeselektor remix of the new Apparat single, Holdon. Apparat, aka Sascha Ring released the excellent album Walls in 2007, though it seemed to elude most end of year polls and plaudits. Released on his own label Shitkatapult (co-owned by T.Raumschmiere), Walls was one of the finest electronic records of the last few years. The previous year Apparat released Orchestra of Bubbles with his partner Ellen Allien, head of the influential Berlin label bpitch Control. Ring is rapidly becoming one of the most exciting electronic music producers working today, so it’s no surprise that he chose another bunch of mavericks Modeselektor to remix Holdon. The original single featured vocals by Raz oHara, who will be releasing his own album, Raz oHara and the Odd Orchestra on the fabulous Get Physical label sometime soon. I’ve been listening to it for a few weeks now and it’s great, a real departure for the label. There. I’m not known for being concise, but I reckon that’s about as many links as I can possibly fit into a one paragraph post. And if you check out Apparat’s myspace from the link above, make sure to listen to Fractales Pt 1, it was the standout track from the album. The Modeselektor remix can be found by clicking the Pampelmoose link and searching along the right hand side column.